The objective of this review is to form a short compilation of phytochemical screening, pharmacological activity and some analytical methods available for Sapindus mukorossi plant. Although the plant is of importance in Ayurvedic system of medicine mainly as cleansing agent, a review article based on the phytochemical and pharmacological screening of Sapindus mukorossi is not so far reported. The main phytoconstituent isolated and identified from different parts of this plant are triterpenoidal saponins of oleanane, dammarane and tirucullane type. The structure and chemical name of the all the types of triterpenoidal saponins reported in Sapindus mukorossi is included in this review. Many research studies have been conducted to prove the plant’s potential as spermicidal, hepatoprotective, anti-inflammatory, anti-protozoal etc. This review focuses on the phytochemistry and pharmacological actions of Sapindus mukorossi. INTRODUCTION: Sapindus mukorossi (fam: Sapindaceae), well known as soapnuts, are used medicinally as an expectorant, emetic, contraceptive, and for treatment of excessive salivation, epilepsy, chlorosis, and migranes. Sapindus mukorossi is a popular ingredient in Ayurvedic shampoos and cleansers. They are used in Ayurvedic medicine for treatment of eczema, psoriasis, and for removing freckles. Soapnuts have gentle insecticidal properties and are traditionally used for removing lice from the scalp 1. Most of the phytochemical constituents of this plant have been discovered by various scientists. Among them the most explored phytoconstituents are triterpenoidal saponins of mainly three types viz oleanane, dammarane and tirucullane type. Recently many of the pharmacological actions of this plant has been explored which includes the antimicrobial, hepatoprotective, insecticidal, piscidal activity. One of the most talked activities of this plant is the contraceptive activity of the saponins extracted from the pericarp of the fruits. Botanical description: It is known as tree of North India, a deciduous tree, known to the common man as ‘areetha’. It is also known as doda, dodan, and ritha in Indian dialects. It is one of the most important trees of tropical and sub-tropical region of Asia. It is common tree in Shivaliks and the outer Himalayas of Utter Pradesh, Uttranchal, Himachal Pradesh, Haryana and Jammu and Kashmir 2. It is a fairly large, deciduous tree, usually up to 12 m in height, sometimes attaining a height of 20 m and a girth of 1.8 m, with a globose crown and rather fine leathery foliage. Bark: dark to pale yellow, fairly smooth, with many vertical lines of lenticels and fine fissures exfoliating in irregular wood scales. Blaze: 0.8-1.3 cm, hard, not fibrous, pale orange brown, brittle and granular. Leaves: 30-50 cm long, alternate, paripinnate; common petiole very narrowly bordered, glabrous; leaflets 5-10 pairs, opposite or alternate, 5-18 by 2.5-5 cm, lanceolate, acuminate, entire, glabrous, often slightly falcate or oblique; petioles 2-5 m long. Inflorescence: a compound terminal panicle, 30 cm or more in length, with pubescent branches. Flowers: about 5 mm across, polygamous, greenish white, subsessile, numerous, mostly bisexual. Sepals 5, each with a woolly scale on either side above the claw. Fruit: a globose, fleshy, 1-seeded drupe, sometimes 2 drupels together, about 1.8-2.5 cm across. Seed: 0.8-1.3 cm in diameter, globose, smooth, black, loose in dry fruit 3. Assamese: Haithaguti, Bengali: Ritha, Hindi: Aritha, Dodan, kanmar, Kumon: Ritha, Punjabi: Aritha, Dodan, Ritha, Thali, Sanskrit: Aristha, Phenila, Urista, United provinces: Kanmar, Ritha, Italian: Uriya, Telugu: Kunkudu. Morphological parts used: Woods, seeds, pericarp extracts, kernels etc. Phytochemistry: Seeds of Sapindus mukorossi contain 23 % oil of which 92 % is triglycerides; the triglyceride fraction contained 30 % oleo-palmito-arachidin glyceride, 13.3 % oleo-diarachidin glyceride and 56.7 % di-olein type glycerides such as dioleo-palmitin, dioleo-stearin and dioleo-arachidin 6. According to Sengupta et al., two lipid fractions A and B were isolated from Sapindus mukorossi seed oil by preparative TLC(Thin Layer Chromatography). Fraction A (70.4%, Rf value 0.76) is a normal triglyceride and its fatty acid compositions was determined by GLC (Gas Liquid Chromatography). Fraction B (29.6%, Rf value 0.51) shows the presence of nitrogenous constituents. This non-glyceridic component of the seed oil is a cyanolipid (1-cyano-2-hydroxymethyl prop-1-ene-3-ol) 7. Fruits of Sapindus mukorossi are reported to contain sesquiterpenoidal glycosides and six different fatty ester of tetracyclic triterpenoids 8. Leaf extract of Sapindus mukorossi contains different type of flavanoids like quercetin, apigenin, kaempferol and rutin. All these flavanoids were isolated by column chromatography on a polyamide sorbent 9. Various types of triterpene, saponins of oleanane, dammarane and tirucullane type were isolated from the galls, fruits and roots of Sapindus mukorossi. Oleanane type triterpenoid saponins named Sapindoside A&B (Fig. 34 & 35) were reported from the fruits of Sapindus mukorossi 10. Sapindoside C (Fig. 36) 11, Sapindoside D (Fig. 37 ) 12, which is a hexaoside of hederagenin, and Sapindoside E (Fig. 38) 13, a nonaoside of hederagenin, was isolated and identified by Chirva et al from the methanolic extract of the fruits of Sapindus mukorossi. Dammarane-type saponins, named Sapinmusaponins A & B (Fig. 11 & 12), C-E (Fig. 15, 16, 17), together with three known phenylpropanoid glycosides, were isolated from the galls of Sapindus mukorossi 14. Tirucallane-type saponins, sapinmusaponins F-J (Fig. 18-22), were isolated from the galls of Sapindus mukorossi as reported by Huang et al., 15. The structures of these saponins were elucidated on the basis of spectroscopic analysis including 1D and 2D NMR techniques. Triterpene saponins of oleanane type like, Sapinmusaponin K-N (Fig. 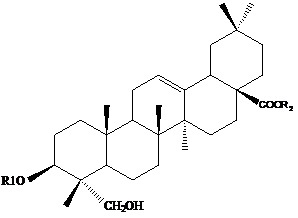 25-28), Mukorozisaponin G & E1 (Fig. 29-30), Sapindoside A & B along with dammarane types like Sapinmusaponin O and P (Fig. 13 & 14) were isolated from fruits and the galls of Sapindus mukorossi as per Huang et al., 16. In another study by Nakayama et al., 17 Mukorozisaponin Y1 (Fig. 31), Y2 (Fig. 32), X (Fig. 33) were isolated from the pericarp of Sapindus mukorossi. 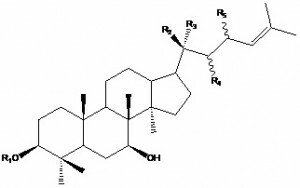 Fractionation of an ethanolic extract of the galls of Sapindus mukorossi has resulted in the isolation of two tirucallane type triterpenoid saponins, sapinmusaponin Q and R (Fig. 23-24), along with three known oleanane type triterpenoid saponins: sapindoside A, sapindoside B, and hederagenin-3-O-[β-D-xylopyranosyl-(1→3)]-[α-L-rhamnopyranosyl- (1→2)]-α-L-arabinopyranoside 18. The roots of Sapindus mukorossi contain tirucallane-type triterpenoid saponins like Sapimukoside A & B 19, Sapimukoside C &D 20 as reported by Teng et al. Further investigation of the roots of Sapindus mukorossi by the Ni et al reported the presence of, Sapimukosides E-J 21. The structures of Sapimukosides A-J are shown in Fig. 1 to Fig. 10 respectively. Saxena et al., 22 recognized six different saponins from the fruits of Sapindus mukorossi by LC-MS. They were found to be Sapindoside A, Sapindoside B, Sapindoside C, Sapindoside D, Mukorozisaponin E1 and Mukorozisaponin Y1. The chemical names of all the types of saponins mentioned above are summarized in Table 1. (The chemical names are as reported by the authors in various journals). Phytoanalytical methods: A colorimetric assay method for the estimation of total saponin content of Sapindus mukorossi was reported by Diwedi et al 23. High performance thin layer chromatography (HPTLC) as well as high performance liquid chromatography (HPLC) method combined with ES-MS are developed and validated for fingerprinting Sapindus saponin and quantitative determination of Sapindoside B, one of the oleanane type triterpene saponin, in bulk drug samples of Sapindus saponin and its formulation consap cream 22. Insecticidal activity: Ethanolic extract of Sapindus mukorossi was investigated for repellency and insecticidal activity against Sitophilus oryzae and Pediculus humanus. Average mortality percentage indicated that the extracts caused significant mortality and repellency on the target insects and bioassays indicated that toxic and repellent effect was proportional to the concentration 24. 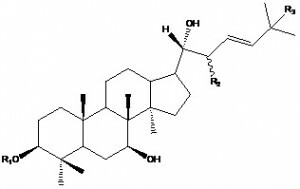 Spermicidal activity: Saponin isolated from Sapindus mukorossi has potent spermicidal activity. Morphological changes in human ejaculated spermatozoa after exposure to this saponin were evaluated under scanning electron microscopy. The minimum effective concentration (0.05% in spot test) did not affect the surface topography after exposure for 1 minute. However, incubation of spermatozoa for 10 minutes resulted in extensive vesiculation and disruption of plasma membrane in the head region. Higher concentrations (0.1%, 1.25%, 2.5% and 5.0%) caused more or less similar changes which included vesiculation, vacuolation, disruption or erosion of membranes in the head region. These findings suggest that the morphological changes observed are due to alterations in the glycoproteins associated with the lipid bilayer of plasma membrane of spermatozoa 25. Another intimate use of soapnut is as a contraceptive cream. Very soon consap a contraceptive cream developed by the Lucknow CDRI is going to hit the Indian markets. It is advocated to be totally safe and easy to use. It is intended for post-coital use 26. The cream is recommended for all women of reproductive age group who want to space their children. It is safe and free from systemic side effects on continuous prolonged use. The preparation has been developed by using saponins from the soapnut or reetha (Sapindus mukorossi). The cream went through all regulatory testing and Phase I, II and III clinical trials and proved to be an effective contraceptive product. DCG (I) cleared the cream for use. It has been licensed to the Hindustan Latex Limited who is going to market the product 27. Spermicidal activity on human sperm of polyherbal pessary, formulated with purified ingredient from neem leaves, S. mukorossi (pericarp of fruit) and Mentha oil was tested by Sander-Cramer slide test in vitro and by post-coital tests in vivo. The combination of three herbal ingredients resulted in potentiation of spermicidal action by eight folds, when tested in rabbit 28. Anti-protozoal activity: The gonotropic cycle of female Anopheles was impaired by exposure to neem, reetha (S. mukorossi) and garlic 29. Anti-inflammatory activity: The anti-inflammatory activities of hederagenin and crude saponin isolated from Sapindus mukorossi were investigated utilizing carrageenan-induced edema, granuloma pouch and adjuvant arthritis in rats. The effects of these agents on vascular permeability and acetic acid-induced writhing in mice were also examined. In some experiments, the results were compared with those obtained with saikogenin A, crude platycodin, platycodigenin and oleanolic acid. Anti-inflammatory activity on carrageenan edema was observed with i. p. and p. o. administered crude saponin, while hederagenin and the other agents used showed activity only when administered i. p. Hederagenin, 100 and 200 mg/kg p. o. per day for 7 days, showed no significant inhibitory effect on granuloma and exudate formations in rats, while crude saponin, 100 and 200 mg/kg p. o., showed significant effects. Crude saponin, 200 mg/kg p. o. per day for 21 days, significantly inhibited the development of hind paw edema associated with adjuvant arthritis in rats, but hederagenin, 50-200 mg/kg p. o., did not. Crude saponin, 400 mg/kg p. o., inhibited the increase in vascular permeability and the number of writhings induced by acetic acid in mice. The results suggest that hederagenin and crude saponin, as well as the other agents used, show some degree of anti-inflammatory activity, especially in the case of saponin 30. Cytotoxic activity: In- vitro cytotoxic activity of triterpenoid saponins from Sapindus mukorossi showed that α-hederin, β-hederin, Sapindoside A, Sapindoside B, Sapindoside C, Sapindoside D exhibited good cytotoxic activity at 10μg/ml to 100μg/ml when tested on four cell strains like Mouse B16 melanoma cells, Mouse 3T3 non-cancer fibroblasts, Flow 2002 non-cancer human cells and HeLa human tumor cells. Strychnopentamine was the reference compound used in the study. All saponins were reported to be at least 5 times less active than the reference compound 32. Hepatoprotective activity: The dried powder of S. mukorossi and R. emodi was extracted successively with petroleum ether, benzene, chloroform, and ethanol and concentrated in vacuum. In- vitro and in- vivo studies were done to prove the hepatoprotective activity of different extracts of S. mukorossi and R. emodi. Primary rat hepatocyte monolayer cultures were used for in vitro studies. These cultures were treated with CCl4 and extracts of S. mukorossi & R. emodi. A protective activity could be demonstrated in the CCl4 damaged primary monolayer culture. For the in vivo study, the hepatoprotective capacity of the extract of the fruit pericarp of S. mukorossi and the rhizomes of R. emodi was analyzed in liver injured CCl4- treated male rats. Extracts of the fruit pericarp of S. mukorossi (2.5 mg/mL) and rhizomes of R. emodi (3.0 mg/mL) were found to have protective properties in rats with CCl4 induced liver damage as judged from serum marker enzyme activities. Thus, it was concluded that the extracts of S. mukorossi and R. emodi do have a protective capacity both in vitro on primary hepatocytes cultures and in in- vivo in a rat model of CCl4 mediated liver injury 33. Anti-platelet aggregation activity: Biological evaluation of ethanolic extract of the galls of S. mukorossi showed that two saponins isolated, Sapinmusaponins Q and R, demonstrated more potent anti-platelet aggregation activity than aspirin 18. Sapinmusaponins F-J isolated from the galls of S.mukorossi showed anti-platelet-aggregation effects, but no obvious cytotoxic activity for platelets as assayed by lactate dehydrogenase (LDH) leakage was reported 15. Anti-trichomonas activity: Using in- vitro susceptibility assay, the MIC of Sapindus saponins for T. vaginalis (0.005%) was found to be 10-fold lower than its effective spermicidal concentration (0.05%). Saponins concentration dependently inhibited the ability of parasites to adhere to HeLa cells and decreased proteolytic activity of the parasite’s cysteine proteinases. This was associated with decreased expression of adhesin AP65 and membrane-expressed cysteine proteinase TvCP2 genes. Saponins produced no adverse effect on host cells in mitochondrial reduction potential measurement assay. Saponins also reversed the inhibitory mechanisms exerted by Trichomonas for evading host immunity. Early response of saponins to disrupt actin cytoskeleton in comparison with their effect on the nucleus suggests a membrane-mediated mode of action rather than via induction of apoptosis 34. Anti-fungal activity: Extracts from the dried pericarp of Sapindus saponaria L. (Sapindaceae) fruits were investigated for their antifungal activity against clinical isolates of yeasts Candida albicans and C. non-albicans from vaginal secretions of women with Vulvovaginal Candidiasis. Four clinical isolates of C. albicans, a single clinical isolated of each of the species C. parapsilosis, C. glabrata, C. tropicalis, and the strain of C. albicans ATCC 90028 were used. The hydroalcoholic extract was bioactivity-directed against a clinical isolate of C. parapsilosis, and showed strong activity. The n-BuOH extract and one fraction showed strong activity against all isolates tested 35. CONCLUSION: S. mukorossi is a common plant available at various places in India. The plant is widely used in cosmetic preparation like shampoos and cleansers. It is reported to contain mainly oleanane, dammarane and tirucullane type saponins. The structures and chemical name of various saponins isolated from S. mukorossi have been compiled in the present review. The pharmacological studies reported in the present review confirm the therapeutic value of this plant. There is a lack of phytoanalytical methods available for the estimation of chemical markers from this plant. Quantitative analysis of the different constituents of S. mukorossi from its different parts is still not successful. Phytochemical studies on this plant except for saponins have not yet been explored. This review will provide a basic idea of most of the phytoconstituents present in S. mukorossi less than one heading With the availability of primary information, further studies can be carried out like phytopharmacology of different extracts, standardization of the extracts, identification and isolation of active principles, and pharmacological studies of isolated compound. Kiritker KR and Basu BD: The Indian Medicinal Plants. Lalit Mohan Basu, Allahabad, Second Edition, Vol. 1, 1933:631. Chopra R and Ghosh S: Poisonous plants of India. The manager of publishers, Delhi, 1946: 308. Dev I, Guha SRD: Glyceride composition of Sapindus mukorossi (soapnut) oil. Indian Journal of Forestry 1979; 2(3):261-263. Sengupta A and Basu SP: Chemical Investigations of the Sapindus mukorossi Seed Oil. Fette, Seifen, Anstrichmittel 2006; 84(10): 411 – 415. Zikova NI and Krivenchuk PE: Chemical study of flavonoids from the leaves of Sapindus mukorossi Gaerth. Farm. Zh 1970; 25:43-45. Article in Ukranian. Chirva V, Kintya PK, Sosnovskii VA, Krivenchuk PE and Zykova NY: Triterpene glycosides of Sapindus mukorossi. II The structure of Sapindoside A & B. Chemistry of Natural Compounds 1970; 6(2): 213-215. Chirva V, Kintya PK and Sosnovskii VA: Triterpene glycosides of Sapindus mukorossi. III. The structure of sapindoside C. Chemistry of Natural Compounds 1970; 6(3): 380.381. Chirva V, Kintya PK, Sosnovskii VA and Zolotarev BM. Triterpene glycosides of Sapindus mukorossi. IV. The structure of sapindoside D. Chemistry of Natural Compounds. 1970; 6(3): 316-318. Chirva V, Kintya PK and Sosnovskii VA. Triterpene glycosides of Sapindus mukorossi. V. The structure of sapindoside E. Chemistry of Natural Compounds. 1970; 6(4): 440-442. Huang HC, Wu MD, Tsai WJ, Liao SC, Liaw CC, Hsu LC, Wu YC and Kuo YH: Triterpenoid saponins from the fruits and galls of Sapindus mukorossi. Phytochemistry2008; 69(7): 1609-1616. Nakayama K, Fujino H, Kasai R, Mitoma Y, Yata N and Tanaka O: Solubilizing properties of saponins from Sapindus mukorossi Gaertn. Chemical and Pharmaceutical Bulletin 1986; 34(8): 3279-3283. Huang HC, Tsai WJ, Liaw CC, Wu SH, Wu YC and Kuo YH: Anti-platelet aggregation of Triterpene saponins from the galls of Sapindus mukorossi. Chemical and Pharmaceutical Bulletin 2007; 55(9): 1412-1415. Teng RW, Ni W, Hau Y and Chen CX: Two New Tirucallane-Type Triterpenoid Saponins from Sapindus mukorossi. Acta Botanica Sinica 2003; 45(3):369-372. Article in Chinese. Ni W, Hua Y, Liu HY, Teng RW, Kong YC, Hu XYand Chen CX: Tirucallane Type triterpenoid saponins from the roots of sapindus mukorossi. Chemical and Pharmaceutical Bulletin 2006; 54(10): 1443-1446. Dwivedi AK, Chaudary M and Sarin JPS: Standardization of a new spermicidal agent Sapindus saponin and its estimation in its formulation. Indian Journal of Pharmaceutical Sciences 1990; 52(3): 165-167. Dhar JD, Bajpai VK, Shetty BS, Kamboj VP: Morphological changes in human spermatozoa as examined under scanning electron microscope after in-vitro exposure to saponins isolated from Sapindus mukorossi. Contraception. 1989; 39(5): 563-568. 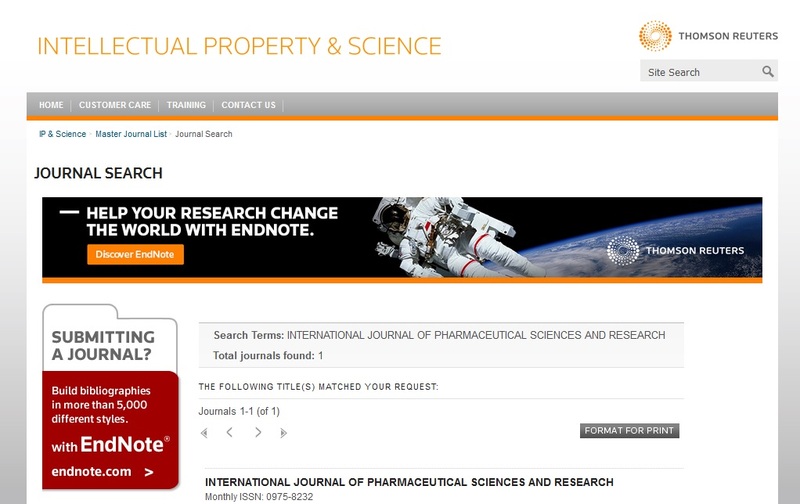 Central Drug Research Institute website. Available at http://www.cdriindia.org/consap.htm. Accessed on September 27, 2008. Garg S, Taluja V, Upadhyay M and Talwar GP: Studies on contraceptive efficacy of Praneem Polyherbal Cream. Contraception 1993; 48(6): 591-596. Takaji K, Park E, and Kato H: Anti-inflammatory Activities of Hederagenin and Crude Saponin isolated from Sapindus mukorossi GAERTN. Chemical and Pharmaceutical Bulletin 1980; 28(4): 1183-1188. Virdi GS: The piscicidal properties of acorus- calamus, Sapindus-mukorossi and Xeromphis-spinosa on 7 species of fishes of North India. Indian Journal of Physical and Natural Sciences 1982; 2: 28-35. Takechi M and Y. Tanaka Y: Structure activity relationships of the saponin α-hederin. Phytochemistry 1990; 29: 451-452. Ibrahim M, Nane Khaja M, Aara A, Khan AA and Habeeb MA: Hepatoprotective activity of Sapindus mukorossi and Rheum emodi extracts: In vitro and in vivo studies. 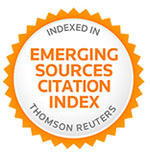 World Journal of Gastroenterology 2008; 14(16): 2566-2571. Tsuzuki JK, Svidzinski TIE, Shinobu CS, Silva LFA, Rodrignes-Filho E, Cortex DAG and Ferreira ICP: Antifungal activity of the extracts and saponins from sapindus saponaria. Annals of the Brazilian Academy of Sciences 2007; 79(4):577-583.